Washable and reusable - rinse and reuse! Dorm Co. Tip: A dorm essential for cleaning when you first move in and on move out day! When making your college dorm checklist and doing your dorm room shopping, make sure you have plenty of cleaning supplies on your list. Luckily, that won't take up much room because of our Lavender Scented Cleaning Wipes! 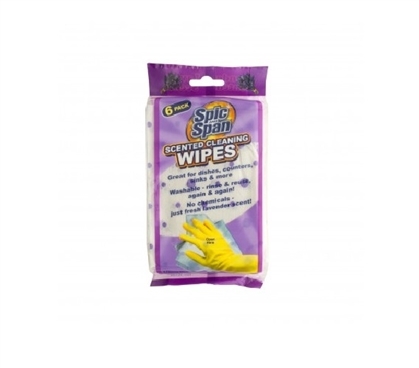 Our Lavender Scented Cleaning Wipes are compact to be easily stored and they are reusable! That's right, they're reusable - simply rinse and reuse to save dorm room storage space and money! These dorm essential Lavender Scented Cleaning Wipes can even be used wet or dry so if you need to do some simple dusting or you need to really scrub at a stain, you can have both options in one multi-purpose dorm item! This handy set of college supplies comes with 6 lavender scented wipes. These wipes can clean and polish any surface, which is essential for your college dorm room. Don't even think about unpacking your dorm essentials without cleaning your dorm room first! Clean the tops of all your college provided dorm items, as well as the inside of your closet and the insides of your dresser and desk drawers with our Lavender Scented Cleaning Wipes! These dorm necessities will also come in handy when you're moving out at the end of the year - you want to make sure your college dorm room is as clean as can be and in good condition so you don't have to pay damage fines. Whether you're moving in, moving out, or doing general cleaning in your dorm room, make sure you have plenty of these cheap dorm supplies on hand!